Columbia police arrested a 27-year-old man following a domestic incident that led to a Thursday afternoon vehicle search. Shortly before 2:30 p.m., Columbia police received a 911 call reporting a possible abduction from the 2600 block of Deercreek Court. The caller was able to provide a vehicle description along with an Illinois license plate number. 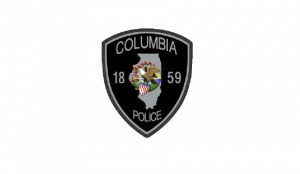 “The caller reported a female passenger screaming for help from the passenger seat while a male driver restrained the passenger by holding her with his arm around her neck,” Columbia Police Chief Joe Edwards said. Officers responded to the area, and a vehicle description was given to Illinois State Police, who put out an areawide broadcast. Officers from Dupo, Cahokia, the St. Clair County Sheriff’s Department and Belleville assisted. A St. Clair County deputy located the suspect, victim and vehicle in the 7200 block of Triple Lakes Road. Arrested for domestic battery, unlawful restraint and endangering the life of a child in the case is Charles V. Grissom Jr., 27, of Columbia.